This service is focused on identifying your primary passion for meaningful work after retirement along with your innate hard wiring. The core is our Career Match Assessment which matches your attributes and aspirations to over 60,000 career, ministry and non-profit options. Testing is combined with personalized counseling (in office or by telephone) to help maximize your retirement and schedule preferences in order to make the most of your retirement years. All best matches are numerically coded so as to link up with websites which list employers in your local area including non-profits, ministry organizations as well as businesses. The IDAK Career Match assessment exercises with a large inventory of over 90,000 job options with specific localized opportunities. Personality and temperament testing combined with an aptitude assessment interview. Personal, individualized counseling is provided over the phone or in our office in two, 90-minute sessions. IDAK provides aptitude assessment of natural talents as part of career counseling, career coaching, career advisement and outplacement services. IDAK also provides character, temperament and talent assessment for employment screening, new hire screening and training for employment screening. 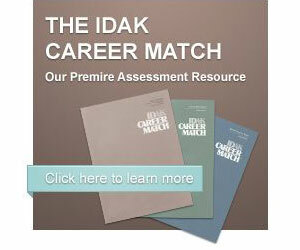 IDAK assists non profits, closely held businesses, ministry service organizations to maximize individual productivity. IDAK assists colleges, universities and seminaries with student assessment to maximize student career focus, student retention, student placement and alumni relations.